The desire for smart living is gaining more and more in importance. While the owner wants to see their wishes implemented quickly, it is useful for the electrician if the customer can give them the most concrete information possible at the technical level. 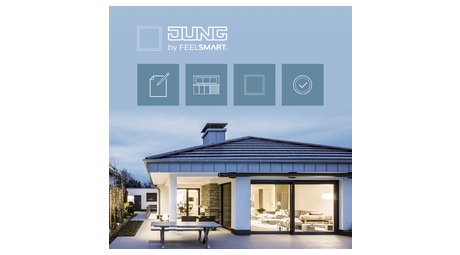 The fast and simple way to the Smart Home is called “JUNG by FEELSMART”. It has been possible to configure cars according to personal wishes and requirements for a long time. With the JUNG Basic Configurator based on FEELSMART, the methodology of the automotive industry is transferred to the electrical sector. The user plans their smart home independently with little information and the selection of the design. The basis of the planning is the floor plan of their house. The configurator determines the required operating elements and devices for the distribution from the rooms, windows and doors. Four equipment levels – from Basic to Premium – are recommended, as well as 25 additional options such as heating control, energy metering or the connection of the door communication. The costs remain transparent, as the list prices are displayed at all times. At the end of the configuration, the user receives a PDF file with a unique code. Every specialist business with access to the Pro version of the FEELSMART configurator can read this code, provide their customer with offers and finalise the planning. Advice times and costs for consultations are clearly reduced by this. For more information and access to the “JUNG by FEELSMART Configurator”, see www.jung.de/feelsmart. 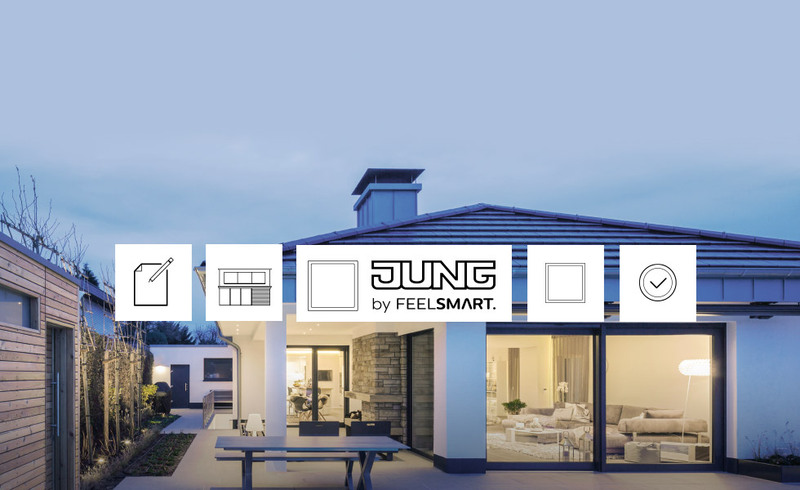 The fast and simple way to the Smart Home is called “JUNG by FEELSMART”. The online configurator leads owners and architects step by step through the individual planning steps.